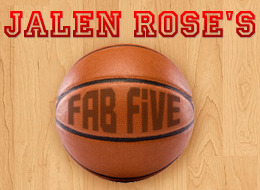 Jalen Rose is a former 13-year NBA star and current ESPN basketball analyst but may be best known for being a member of the famous University of Michigan Fab Five. Let me start off by saying I don’t play golf, but I do watch and I am a big fan of the sport. Over the past decade, I’ve watched as Tiger Woods has become the face of golf around the world. He is unbelievably important to the game, and that has to change. Having been in the NBA for 13 years I know the meaning of a sport as a business. Sometimes, superstars in the game become synonymous with their sports. Just like in basketball we had Michael Jordan, in boxing we had Mike Tyson, in tennis we had Pete Sampras, in golf we have Tiger Woods. However, those other sports went on and flourished after those stars retired. What the PGA needs to understand and implement is the notion that they cannot hinge the business of golf onto just one player — it’s not practical. Golf existed before Tiger, and it will exist after he leaves.